Combining a few documents from DocX format to PDF is not a problem, but it usually takes some time to arrange documents properly. You need to copy paste info from all required documents into one in Microsoft Office, and only then use standard option 'Save as PDF'. Compared to this PDF Combine Pro offers a far more comfortable way to merge several DocX files into one PDF document. It just takes all your DocX files and produces one multi-page PDF. If you have several folders with DocX files our tool can combine files within folders. Note that PDF Combine Pro supports not only DocX files, but also DOC, TXT, RTF, HTML, TIFF, JPEG and many other formats. Merging DocX files to Pdf you may want to set some additional options. 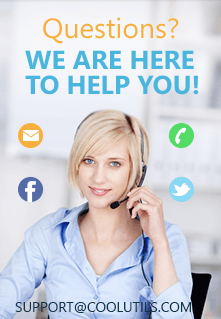 PDF Combine Pro is ready to serve you. Add page counters, a date or any text to your PDF pages. Select the size and paper orientation for output files. Automatic bookmarks generation (each file name will become a bookmark, it's pretty handy to navigate such files). Group DOCX files into one PDF file by common name part. Encrypt final PDF with user permissions. Sign output PDF with your digital signature. Most users rely on these options when combining documents into PDF. The settings are made in handy wizard that pops up after you select source DocX documents and press 'Combine' button. You are always welcome to use the default settings. The options are separated to a few tabs, so you can easily find the parameters you require. In the last tab you will find a button for generating command to merge DocX into multi-page PDF from the command line. It will be saved in .bat file that you will need to call in CMD processor. PDF Combine Pro is an amazing app for easy and quick export of DocX files to a single PDF document. When you need to process a lot of files and combine them to groups basing on common name part, you don't need to do any manual selection and repeat combining process for each group separately. PDF Combine Pro can do this automatically. You just select the proper combining mode in settings wizard and that's all! 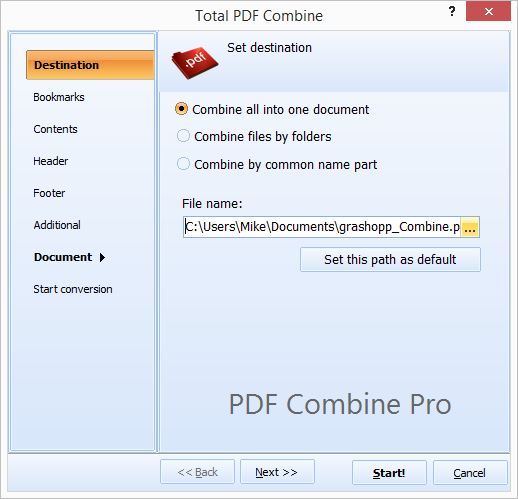 You can try all PDF Combine Pro features right now, as the up-to-date pack is already available here.